Every Tuesday, June 5, 12, 19, 26 from 5-7 PM; Saturdays June 9 and 30 from 1-4 PM. Critical Media Lab, 44 Gaukel Street, Kitchener, Produced by Critical Media Lab. As part of its ongoing investigation of digital rituals, the CML invites participants to partake in a memorial service for dead cell phones and defunct digital files. Join us for a ritual laying to rest of your old handheld devices, complete with a machine-generated eulogy, a 3D printing ceremony, and an e-waste gravesite dedication. Or come and purge unwanted files, apps, and user accounts on your current device, and send them off to digital purgatory. 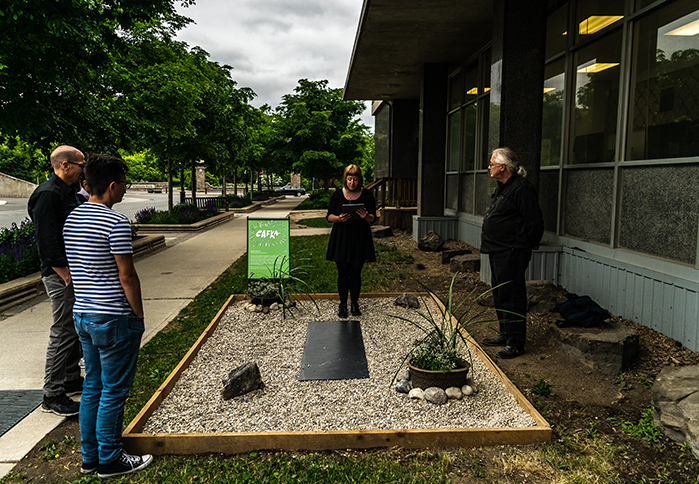 The results of these ritual acts will be commemorated on a memorial slab displayed at the Critical Media Lab for the duration of CAFKA. Digital obituaries will be posted on Critical Media Lab's web site. *Note that e-waste cell phones can be dropped off at CAFKA headquarters at any time, and we will ritually discard of them for you. The Critical Media Lab (CML) supports research/creation projects that reflect on the impacts of technology on the human condition. The Founding Director, Marcel O'Gorman, is a Professor of English at the University of Waterloo and a University Research Chair in critical media. To develop Digital Rituals, O'Gorman collaborated with graduate students from his department, including Stephen Fernandez, Matt Frazer, Julie Funk, Megan Honsberger, Jason Lajoie, Phil Miletic, and Andy Myles. Photos above: Shaquille De Peazer.